The 25-year-old murder suspect who met his wife’s lover in their home after he returned home late on March 16, struck his head repeatedly against the wall until he dropped to the floor dead. His wife Titilayo Olayiwola who however denied having an affair with the deceased, claimed her husband abandoned her in the house for the past eight months, with an instruction to the gateman to be monitoring and feeding him with information if he sees her with any man. She further disclosed that the deceased who was a cobbler, brought his girlfriend to a room in their house due to his closeness with the family and because he was not living alone. The state Police Public Relations Officer, Abimbola Oyeyemi, who confirmed the arrest of the man who killed his wife’s lover, said the remains of the victim have been deposited at the general hospital mortuary for post mortem examination while the case has also been transferred to the homicide section of the state criminal investigation and intelligence department for further investigation. The post Shocking! 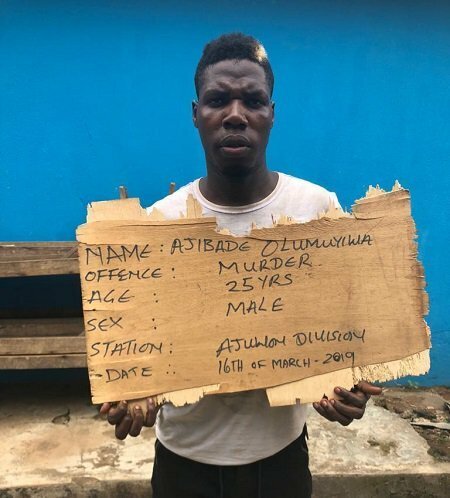 Man Arrested For Killing His Wife’s Lover In Ogun State appeared first on Naijaloaded | Nigeria’s Most Visited Music & Entertainment Website.